Luton Town boss Nathan Jones says players in his title-winning youth side should not be expected to "take the world by storm" in the first team. 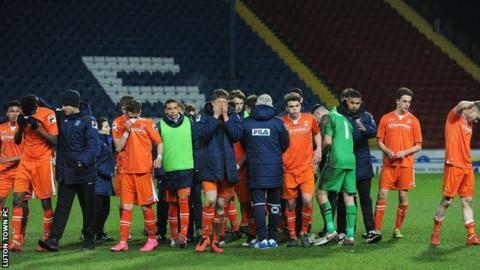 The Hatters under-18s have already won the South-East Youth Alliance league and made the FA Youth Cup last eight. "It won't depend on league position. If they are ready they will play," Jones told BBC Three Counties Radio. "I won't just hand them something because life's not like that and neither is the football club." He added: "If they earn it and keep doing as they're doing, I'm sure they'll get an opportunity." Two youth players have been given professional deals this season, captain Frankie Musonda and James Justin, and the youth side are also in the Youth Alliance southern area League Cup final. "If any club wants to be successful then home-grown players are paramount," added Jones, whose side are currently 13th in League Two, nine points off the play-off places going into Saturday's trip to second-from-bottom-York. "The fans see them as one of their own, As soon as they're ready and they have the ability then they'll get the opportunities. "We have a group here that have got a chance of progressing, it's going to take time - you can't just jump straight from the youth team into the first team and expect to take the world by storm."